Exercise is an important adjunct to your treatment. However, be sure to follow your doctor's instructions carefully. Wear comfortable, loose clothes. Do the exercises on a hard surface covered with a thin mat or heavy blanket. If it makes you more comfortable, you may put a small pillow under your neck. Get into the habit of doing your exercises at the same time each day. A good time might be right after you take a warm shower or bath, since the warm water will relax your muscles. Your doctor may suggest that you do one or two of these exercises several times a day to help relieve muscle tension in the back. Make a habit of taking a short break from your work to do the exercises your doctor suggests. (1) Lie flat on the floor in a relaxed position, bring right knee toward the cchest, clasp hands around the knee. Pull right knee toward chest firmly and, at the same time, straighten left leg. Hold up to 5 seconds. Do five times. Repeat with opposite leg. Repeat 5 times. (2)Lie on floor with knees bent, feet flat on floor, arms at sides, palms down. Tighten muscles of lower abdomen and buttock so as to flatten the lower back. Slowly raise lower back and buttocks and hold 5 seconds. Relax. Do five times. (3) Lie on back with knees bent, feet flat on floor, hands at sides, palms down. Tighten muscles of the abdomen and buttocks so as to push the lower back flat against the floor. Hold 3 to 5 seconds. Relax. Do five times. (2)Lie on back, knees bent with feet flat on floor, arms at sides, palms down. Raise left leg up as far as comfortable without overstretching muscles behind the leg. 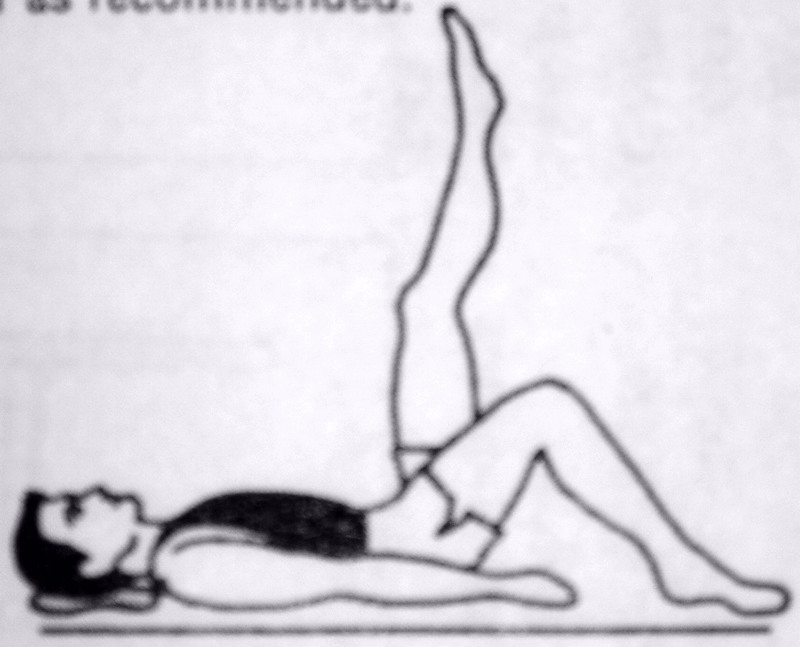 Rreturn left leg to starting position and repeat five times. Repeat exercises with the right leg. Do five times. (1)Lie on the floor with knees bent, feet on the floor and arms at sides. Bring both knees to chest, clasp hands around knees and pull firmly toward chest. Hold 3 to 5 seconds. Relax the tension. Do five times. (3) Lie flat on back, arms at sides, palms down. Slowly raise left leg, bringing raised leg towward the opposite side of the body until you feel the stretch. Rrepeat with the right leg. Do five times. 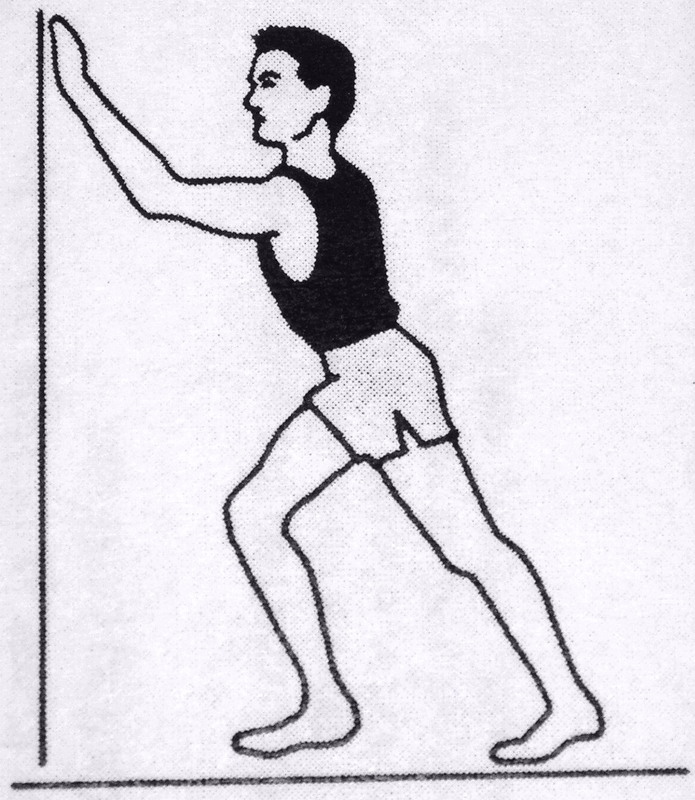 (1) Stand with hands against the wall, left leg approximately 18 inches hehind the right foot, keeping the left heel flat on the floor and the left knee straight. Slowly bend forward until you feel the stretch behind the calf. Hold 5 to 10 seconds. Repeat five times. Repeat same procedure with the opposite leg. (2)Lie flat on the floor, hands clasped behind the neck, knees bent, feet flat on the floor. Tighten buttocks and at the same time lift head and shoulders 2 to 4 inches off the floor, without pulling on your neck. Hold 3 to 5 seconds. Repeat five times.